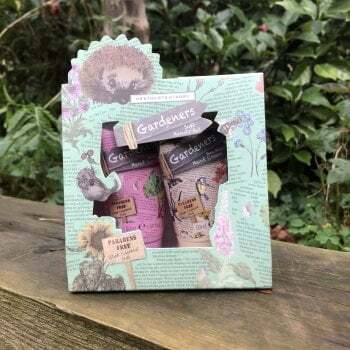 This Heathcote & Ivory soft hands gift set from Ruddick Garden Gifts comes in a lovely little gift box making it an ideal stocking filler, secret santa or gift for the gardener in your life. The gift set contains two 50ml hand creams, the first shea butter hand cream is enriched with shea butter and vitamin E to hydrate tired hands. It is blended with essential oils of lemon, sweet orange and peppermint to leave hands feeling soft and lightly scented. The second hand cream is inspired by British hedgerows and has been formulated with essential oils and elderberry, rhubarb and blackberry extract to hydrate, invigorate and soften hands and sunflower seed oil to soothe and moisturise the skin.